The 2015 NBA Draft saw some Rookies taken in the 1st round that will be making immediate waves for daily fantasy basketball players looking to fill lineups up. When salary cap prices come out at FanDuel some rookies will be overvalued and some will be a sleeper pick that will nicely finish up your DFS roster. The list of 2015-2016 Top NBA Rookies is geared towards daily fantasy players and whether they are going to play well enough to contribute enough points regularly to make them worth picking nightly for a salary cap roster. If you play season long Fantasy Basketball, the rankings below may not apply as much to you but all 10 of the Top NBA Rookies will be nice pickups for you to stash for the whole NBA season. If you are a season long player then you really need to try out playing daily fantasy basketball games at FanDuel.com. They are one of the Top Daily Fantasy Basketball Sites in the world and by joining up use will get 5 Free Fantasy Contests. The Number 1 pick in the NBA Draft in 2015 is also the most NBA ready rookie for daily fantasy basketball lineups. Playing with last year’s Number 1 pick and Rookie of the Year Andrew Wiggins and under the veteran presence of Kevin Garnett – Towns will probably be the 2016 NBA Rookie of the year and a monster for your FanDuel Lineups. Playing for a really bad 76ers team, Okafor could be a daily fantasy basketball gem on nights if his salary cap price stays reasonable. Although not as polished as Towns, Okafor will get a ton of blocks and rebounds and on certain nights with good matchups will get you points from under the basket. Good players on bad teams usually are great plays in DFS. With the Trade of Ty Lawson, the rookie Mudiay will be given every opportunity to be the starting point guard for the Nuggets. Expect some struggles early in the season as most rookie PG’s have to adapt to the NBA game but he’s got a good team around him so he should have some success on nights which will make him a steal for your daily fantasy basketball lineup. Should be the starter in L.A. right away and will have Kobe (if not broken) and Gasol to feed the rock to. Picked #2 overall so you know he has talent, for daily players the concern is that rookie point guards sometimes have bad off nights that can kill your team. 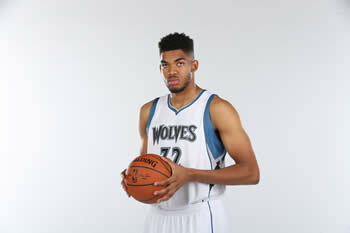 Drafted 11th in the 2015 NBA Draft, many thought he should have been picked sooner. May be starting right away at PF for the Pacers and will be a great source of rebounds and blocks on a nightly basis. With the return of Paul George it remains to be seen how his points will shake out but he will be a lower cost at FanDuel most nights. Frank the Tank will get every opportunity to have minutes at both PF and Center but how he fares against bigger older players remains to be seen. The Hornets may just let him develop over the season and he is going to be a great flier pick to take on certain nights for your DraftKings lineup. He may not be a starter to begin the 2015-2016 NBA season but Johnson will get plenty of minutes to show what he can do for the Pistons. He tore up the summer league so expectations are high on the kid. Look for him to be a cheap salary cap player that may play extra minutes on back to back nights. You can’t teach big and at 6”11 he’s big enough. The Knicks are a bad team so Porzingis may get to start right away and learn the NBA on the fly. Don’t expect a lot from him in 2015/2016 but he could surprise on occasional nights with nice fantasy lines. Probably not going to play a lot of minutes and as a DFS player, he may not be relevant too often unless injuries hit the Magic or he really shows something in games. Another rookie to not really put much stock into but to maybe monitor how things play out in Miami. He will be a bench player and so far in summer league hasn’t shown that he is ready to be a starter so barring a complete change, he won’t be relevant in your daily fantasy basketball DraftKings lineups.